These products are designed to install polyethylene ducting using a screw-in tapered thread to grip the inside diameter of the duct. 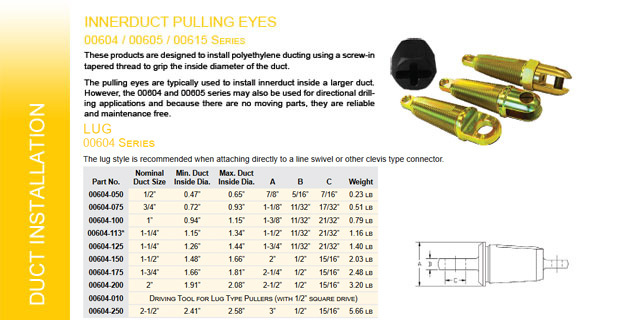 The pulling eyes are typically used to install innerduct inside a larger duct. However, the 00604 and 00605 series may also be used for directional drilling applications and because there are no moving parts, they are reliable and maintenance free. All of these pulling eyes are designed with cutting edges to actually cut a thread in the bore of the ducting as it is being screwed in, much the same way as using a tap to cut a thread in steel. This helps to ensure a reliable grip. 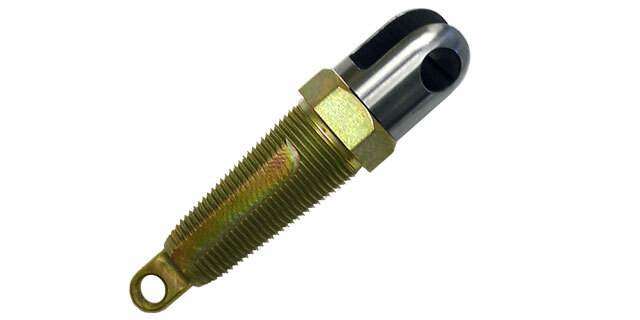 Installation typically requires only 7 or 8 full threads of contact to give a grip stronger than the ducting itself. 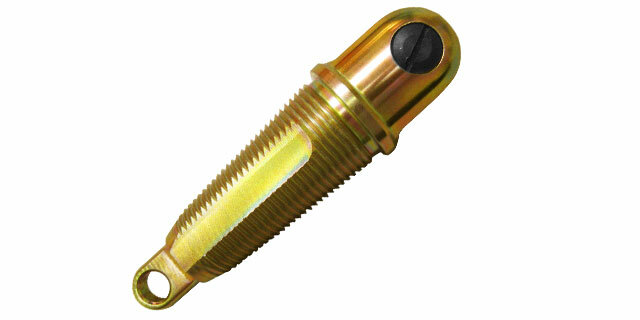 The pulling eyes are installed quickly and easily and require no special tooling. 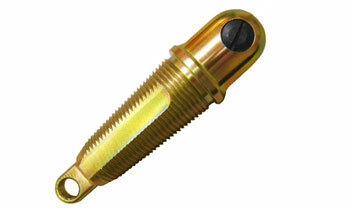 They are manufactured out of steel and plated for durability and corrosion resistance. 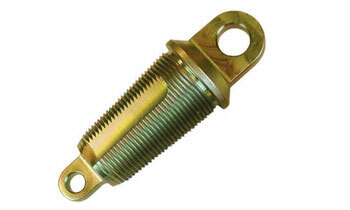 The lug style is recommended when attaching directly to a line swivel or other clevis type connector. 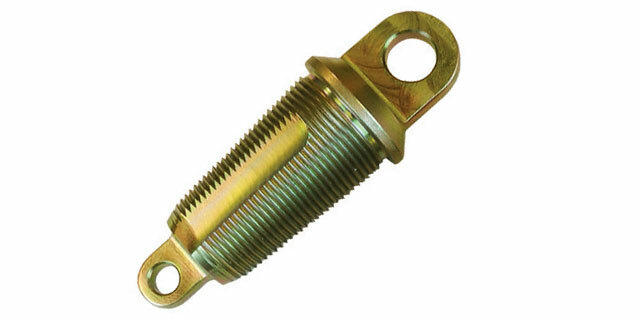 The clevis style pulling eyes are better if attaching to a pulling rope or wire with an eye that can be slotted into the clevis and simply attached with the pin provided. 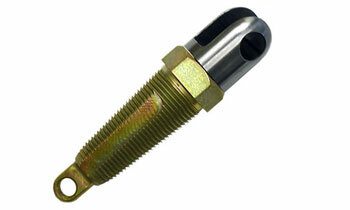 This product is similar to the 00604 and 00605 series, but incorporates a built-in swivel head. 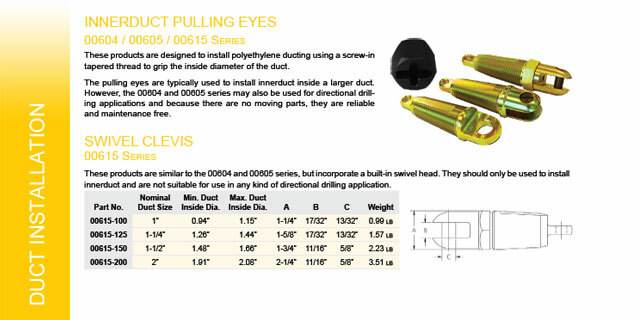 These should only be used to install innerduct and are not suitable for use in any kind of directional drilling application.